Hi, is there anyone that could make a guide how to OC manualy with this board? 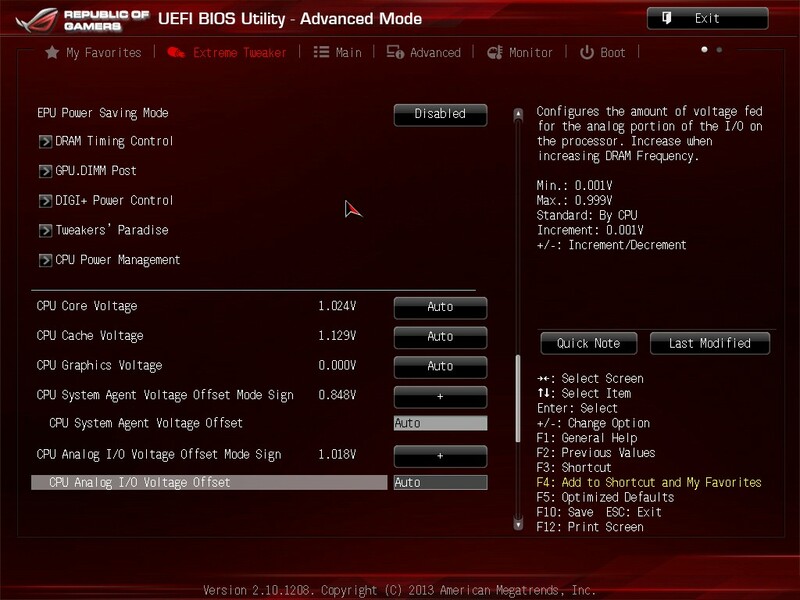 As there is no option to go fully manual mode on the cpu voltage like on the extreme board. I am new to overclocking and I have been trying to find a guide of how to test it out on 4.6 on 1.2 volts to see if I have a good chip or not but I cant find any guide HOW to do so with THIS board. Linus shows how to oc (Intel Haswell 4th Generation Core i5 & i7 Overclocking Guide - YouTube) at min 19.20 - but has manual mode on so he can set the voltage. Last edited by SAS; September 21, 2013 at 07:53 AM. We need system specs to better assist you. ?? I have that board and you can certainly set the voltage manually and about a million other voltages in the bios and from the desktop using the aisuite. I can find it in BIOS - do you mind showing some screenshots? I am a noob - I know - but I want to learn! I have that mobo and a 4770K. I'll just give you a quick glance at some of my settings for now, as I don't have all of them written down. (I'll do tomorrow, it's a great thing to do). Running BIOS rev 0804 (the one that just came out last week). All speedstep and C states disabled. Last edited by Delavan; September 22, 2013 at 06:20 PM. Multi 45 means 4,5GHz resulting clock? That looks pretty good... The initial CPU voltage setting are necessary to be as high, as they are, to post when being overclocked so much...? ^^ Thats not the core voltage that is the standard power to the cpu.